Here's another reason to look forward to the Samsung Galaxy Note 10, which looks set to launch in August 2019. The tenth anniversary Note could have a screen that is tainted by neither ugly notch nor gauche punch-hole, because Samsung is reportedly introducing a pop-up camera to at least one of its new handsets. That news comes from reliable and prolific leakster Ice Universe who tweeted that the upcoming Samsung Galaxy A90 would be "perfect", later adding: "the Galaxy A90 will be Samsung's first pop-up front camera phone, so its screen is perfect, there is no Notch, no Hole." That would make the mid-range Galaxy A90 Samsung's first phone with a pop-up camera. Leaked photos of the Samsung Galaxy S10 range show the trio of smartphones (the S10E, S10 and S10 Plus) with their cameras in a 'hole punch' display, which may or may not be more elegant than a notch or a teardrop, depending on your point of view. That Samsung is debuting the more aesthetically pleasing display on one of its cheaper handsets fits with comments that Samsung Mobile's CEO DJ Koh made to CNBC in September 2018. In an interview, he told CNBC that instead of introducing new technology to its flagship Galaxy S and Note series of phones, the company would bring cutting-edge features to its cheaper models first. Indeed, shortly afterwards, in October 2018, Samsung debuted its first phone with four rear cameras, the mid-range Samsung Galaxy A9. And in December 2018, Samsung unveiled its first phone with a punch-hole camera, the also-mid-range Samsung Galaxy A8s. 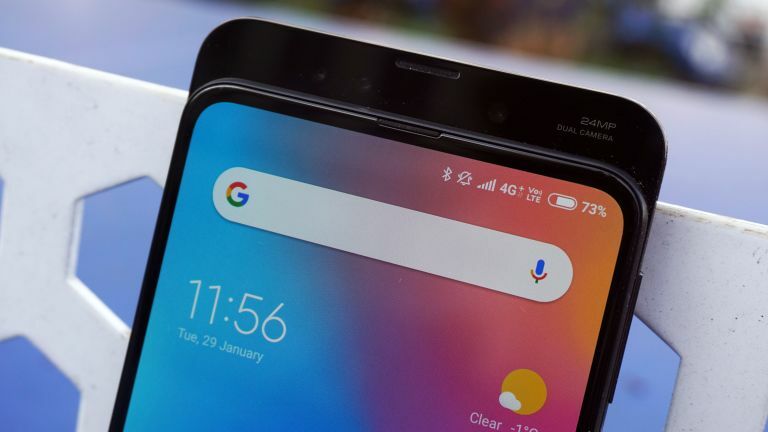 It looks as though we are seeing a similar event unfold here: a new feature that breaks cover on the Galaxy A90 (which 91Mobiles says will be released on February 20, 2019) could later appear on a flagship Samsung phone. And the next flagship Galaxy due for release after the S10 handsets go on sale is... the Samsung Note 10. There's a possibility that the six-month window between the release date of the A90 and the Note 10 doesn't give Samsung time to assess customer feedback on the pop-up camera and then get it into production for the Note, in which case it could make its flagship debut in the Samsung Galaxy S11 in March 2020, but we think Samsung will be pulling out all the stops to make its tenth anniversary Note something special. What's not known is whether the camera in the A9 will be a single pop-up module, as on the Vivo Apex, or whether an entire section of the rear of the phone will slide up to reveal the selfie camera, as on the Oppo Find X and the Xiaomi Mi Mix 3 (shown in the image above). Either way, it seems that the 2019 Note 10 is shaping up to be very worthy of attention. We recently reported that it looks increasingly likely that the Note 10, not the Galaxy S10, will be Samsung's first 5G phone, and if that 5G powerhouse also gets a screen that's free of cut-outs, then no doubt it'll go down very well with reviewers and buyers alike.